Each heart-shaped Kasugai gummy comes individually wrapped to seal in a burst of refreshing flavor and a wonderful aroma. These fruit gummies are better than almost anything comparable we've tried -- from this side of the Atlantic or Pacific! A soft, chewy confection that will taste like you're biting into the fruit itself ... They come in mango, pineapple, apple, grape, litchi, kiwi, orange, and so many more flavors! Yes, they contain sugar, but come on, life is short! Besides, the flavor is so right, you can satisfy a craving with just a few ... Or not! 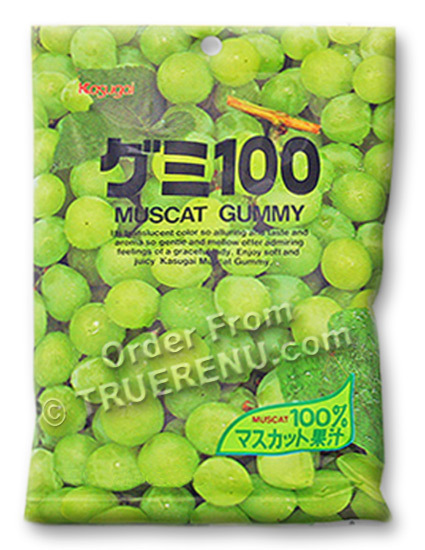 Each Kasugai gummy comes packed with a burst of refreshing apple flavor and a wonderful aroma. Japanese Gummies are one of TrueRenu's favorite treats -- Enjoy! Nutrition Facts: (per gummy/bag) Calories: 16.7/450; Total Fat: 0g/0g; Cholesterol: 0mg/0mg; Sodium: 1.4mg/30mg; Total Carbohydrate (100% from sugars): 5g/105g; Protein: 0.3g/6g; % Daily Values based on 2,000 calorie diet: Vitamin A: 0%/0%; Vitamin C : 8.5%/180%; Calcium: 0%/0%; Iron: 0%/0%. Easy-open bag with individually wrapped yummy fruit gummy candies - Unwrap, Open Wide and Enjoy! Ingredients: Corn syrup (corn starch, water), sugar, concentrated muscat (green grape) juice, gelatin, oblate powder (potato, corn, soybean), D-sorbitol, acidulant (citric acid, malic acid), artificial flavor, pectin, carnauba wax, coloring (beta-carotene), emulsifier (glycerol esters of fatty acids, soybean lecithin), coloring: (FD&C yellow No.5 (tartrazine), FD&C blue No.1 (brilliant blue FCF). Manufactured on shared equipment that processes MILK, WHEAT, SHRIMP, PEANUT, ALMOND ingredients. Product Size: Net Weight: 107g, or about 4.76 ounces. Approx. 27 individually wrapped heart-shaped gummy candies in a easy-open bag.